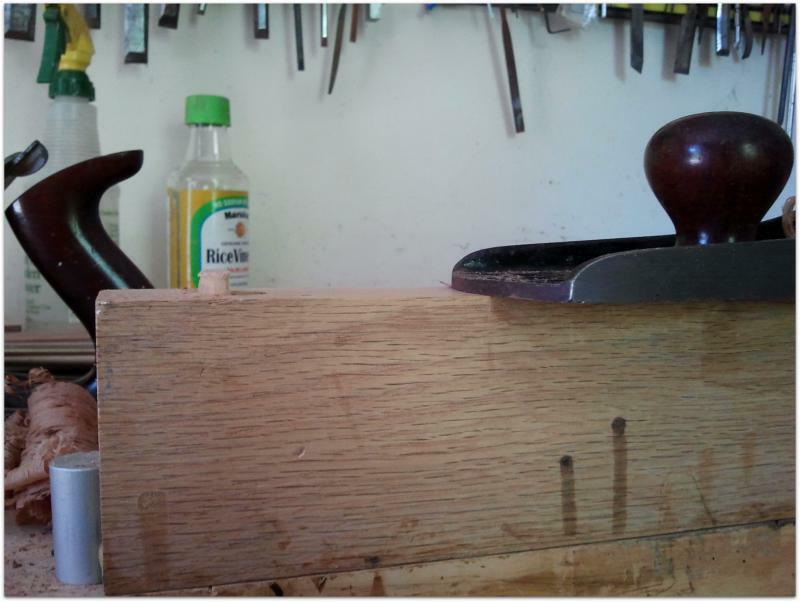 Today I was preparing wood that will become dulcimer necks and fingerboards. I am also preparing stock for the frame of a contemporary style of begena I am making for my friend and fellow musician Temesgen. You should check out Temesgen’s page and listen to his music! A piece of wood can only be hand-planed as flat as the surface beneath it. 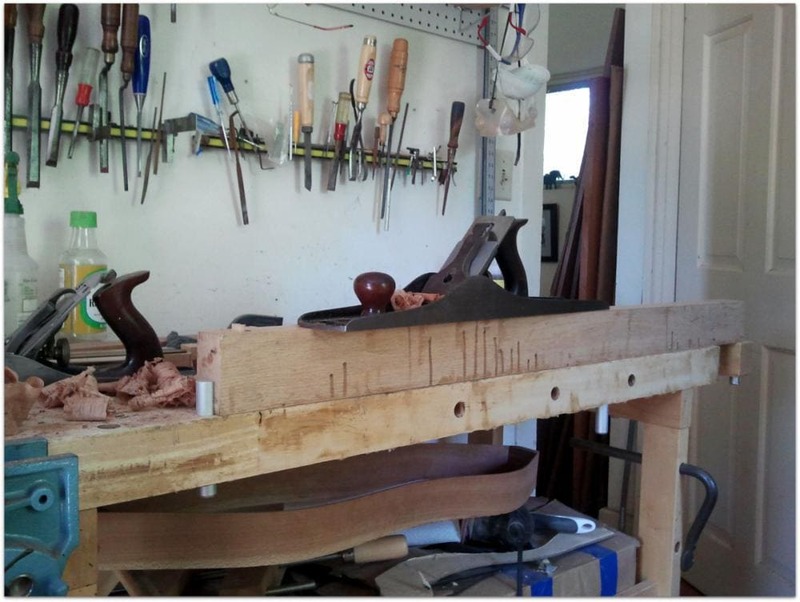 Even a slight warp in the top of the bench will create a concave or convex surface on the final work. Part of my regular shop maintenance is planing the top of my bench flat once or twice a year. I am currently unable to do this as it would put too much stress on my back and legs. In a few months I should be able to level the bench top but I have work to do until then! The stock I needed to plane was long and narrow. It came to me that all I needed was a flat surface long and wide enough to plane the work at hand. My solution was to take a long 2 X 4 of quartersawn oak I had lying around the shop and turn it into a planing surface. I trued up the surface and drilled a hole for a dowel that serves as a bench stop. I clamped the oak beam to the bench top using bench dogs and the end vise. This setup worked so well that I will probably keep using it even after I level the bench top! The plane is my old #7 retrofitted with a thick blade and cap iron. Evart Special: Free Monkey with Every Dulcimer! Necessity is the mother. . . Hope your healing continues, Doug! When I say, ‘Meditate on the Self’ I am asking you to be the Self, not think about it. Be aware of what remains when thoughts stop. Be aware of the consciousness that is the origin of all your thoughts. Be that consciousness.